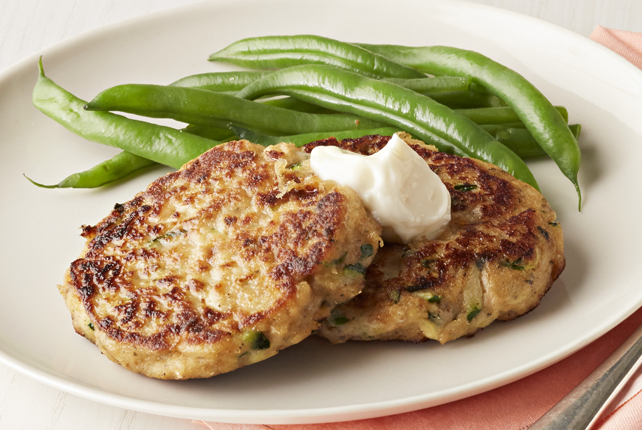 Our Zucchini-Salmon Cakes are perfect for when you have just 30 minutes to make something delicious for dinner. These fish cakes use pantry ingredients and (surprise!) fresh zucchini. Combine first 6 ingredients in medium bowl. Add half each of the Miracle Whip and garlic; mix well. Shape into 8 (1/2-inch-thick) patties. Refrigerate 30 min. Cook patties, in batches, in large nonstick skillet on medium heat 8 min. or until golden brown on both sides, turning carefully after 4 min. Mix remaining Miracle Whip and garlic until blended. Serve with salmon cakes.